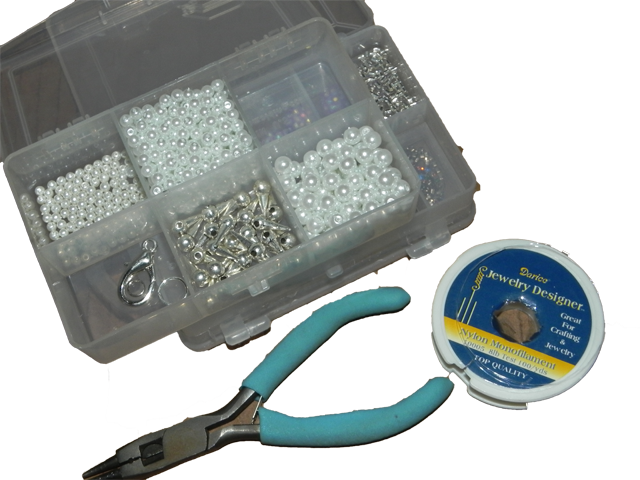 You'll need: Pearl beads (I used the larger and medium ones shown above), spike beads, beading string, scissors, jewelry pliers, crimp beads, two smaller jump rings, a larger jump ring, and a lobster clasp. Cut a length of string and attach one end to a jump ring using a crimp bead. String on the pearls and spike beads in whatever pattern you like. When it reaches the length you want, attach the other end to another jump ring with a crimp bead. Repeat this two more times to make a three strand necklace. Attach the large jump ring to one end and the lobster clasp to the other. I love how this looks on, so edgy yet feminine. And I had all the supplies on hand so this cost me nothing to make. If you bought the supplies, you'd be able to make this for about $10 or so. 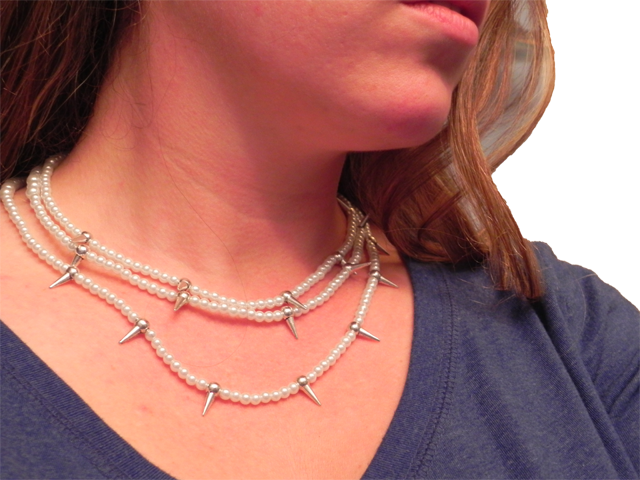 For more spike and pearl loveliness, check out Erin's projects here (links to earrings, but in that post she links to a necklace she made too). LOOOOVE how that necklace turned out! Very pretty!! It turned out great. I really like how you used the larger pearls at the top, then the smaller ones at the bottom. 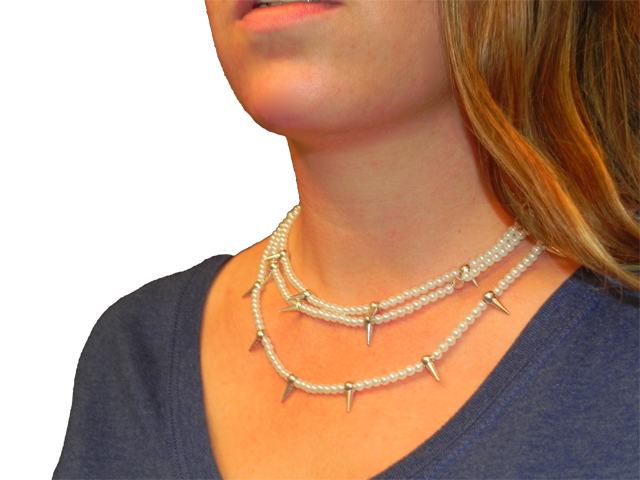 Also, not having huge spikes makes it easier to layer this necklace. Really good DIY - posted top finished photo with a link back to you on my blog. This is so cool, Lia! Thanks for the shout-out, and five DIYs this week?! Super impressed! What a pretty necklace DIY! I LOVE this necklace! It's fantastic! Where did you find the spikes? They fit perfectly because of the bead top. AWESOME! Now I'm dying to make my own.